The Fellowship was fortunate enough to obtain a copy of ROM #1 from IDW Publishing. The plot and script is by Christos Gage & Chris Ryall, with pencils and colors by David Messina, inks by Michele Pasta, and lettering by Shawn Lee. Rom, the greatest of the knights of the Solstar Order, has arrived on Earth to eliminate the remnants of a group of evil magicians called Dire Wraiths. Little does he know that the infestation of the shape-changing creatures is worse that he thought…and they were ready for his arrival. Is Rom ready to handle the greatest challenge as a knight…all by himself? The IDW/Hasbro line continues with the long-awaited return of Rom. For those that don’t know, Rom was a toy created in the late70’s with a Marvel comic series debuting not long after. Christos Gage and Chris Ryall deliver a great story that honors the original premise, yet freshens it up and gives it a modern edge that will please old and new fans. There’s an INVASION OF THE BODYSNATCHERS vibe to this book, and I’m cool with that. David Messina’s art is awesome, definitely liking Rom’s look as well as what we’ve seen of the Dire Wraths. And that ending…wow! Pick this book up now! 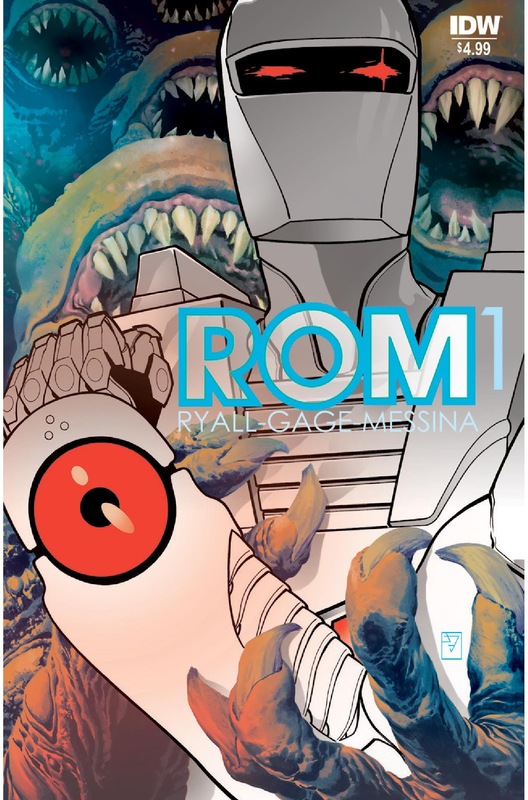 ROM #1 is in stores now, or available for ordering at www.IDWpublishing.com.